Update: Note that under current federal law (October 2013), this beer cannot be labeled gluten free due to the fact that it is made with barley malt. No doubt the variety of gluten-free breads, sweets and snacks these days is plentiful. One product that still lacks diversity, though, is beer. Most of the readily available brews, like Redbridge and Bard's, are derived from sorghum (a type of grass), millet or other grains that don't contain gluten. Now making its way onto these shores is a gluten-free beer from Spanish brewer Damm that is made with - wait for it - barley malt. Whole Foods Market in Plymouth Meeting held a tasting of Daura during the recent Philly Beer Week. Local suds expert Lew Bryson summed up his review of the brew by proclaiming, "Celiacs: your beer has arrived." 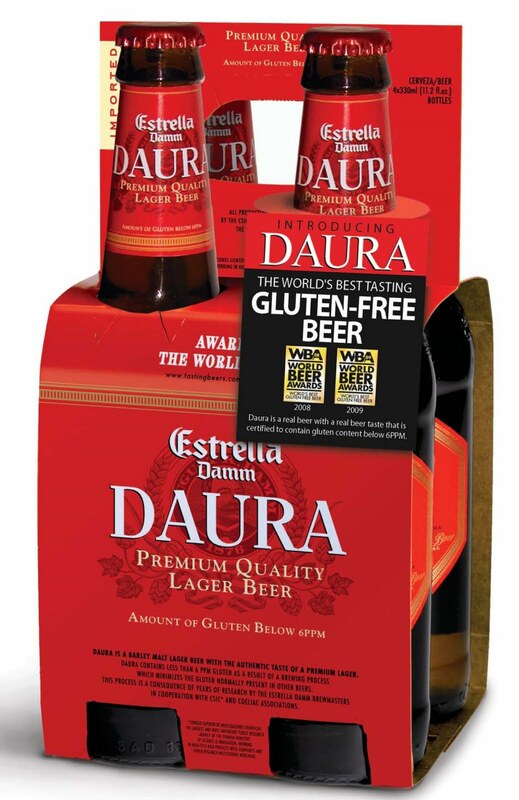 Daura contains 5.4% alcohol by volume - a bit more than Bard's and slightly less than New Grist. Daura is registered with the Pennsylvania Liquor Control Board for sale in the Commonwealth, so Philadelphia-area beer distributors should be able to order it upon request; the Plymouth Meeting Whole Foods stocks the beer at its Cold Point Pub. It's also available at State Line Liquors in Elkton, Maryland - just past the Delaware border off I-95. As the rollout progresses, Daura will be available in more states. The suggested retail price is $7.99 for a four-pack. How very interesting! I am by nature wary of the whole made-with-barley-malt thing. Freaks me out! Hmm.....I am not sure how I feel about this. I know what the test says, but in a way it seems to go against what we are taught. On the other hand, I am sure there are plenty of other GF foods out there that test higher that are considered "GF" that we are eating. See my problem? LOL! Enjoy it if you can get it! It is distilled to meet strict European standards of less than 20 ppm. As you can se from the article, they do even better that that. We enjoyed it in Spain last year. The key is DISTILLING it to less than 20 ppm. Truly beer vs. the US stuff we have to drink here. Hopefully, this beer will not have the fruity, sweet after-taste that the other GF beers have in the U.S. I realize that many people do not experience this after-taste, but it's a real gagger for those who do. Expensive, though, at $5 for a six-pack. Since Green's costs about $5.00/bottle at Whole Foods in Austin, and I buy that on occasion, I don't see cost as an issue. Anyone know anything about the process? Do they use enzymes? I have been drinking this beer for the past year and speaking as a confirmed beer drinker I thank God everyday my husband found it for me. Our local Beer Boys will order it for me. When I was diagnosed with Celiacs I actually thought my life was over.....NO Pizza and NO Beer. ugh! I found most of the GF beers to be really terrible. I can drink Red Bridge if I drink it over ice and add a lemon. No so with Daura, it's great straight from the bottle. But remember to take it slow it does deliver quite a kick. I too, love the Daura. Greens (England) also makes 5 deglutenized beers and Saxon (Finland) has one also. None of these are available in the US yet. I’ve been emailing both companies with encouragement to bring them here. If you check this Swedish study on gluten levels in beer you’ll see that a few “regular” brews actually have less than 20ppm gluten. Pilsner Urquell and Corona Extra are both widely available, but imho Daura tastes better. I just wish someone would make a really hoppy GF beer. Preferably from deglutenized barley. A fresh-hopped IPA would do. Greens is actually available in the US, just in select stores. I have only been able to find it at one Yokes in Pasco, Wa. Thanks for the study info.